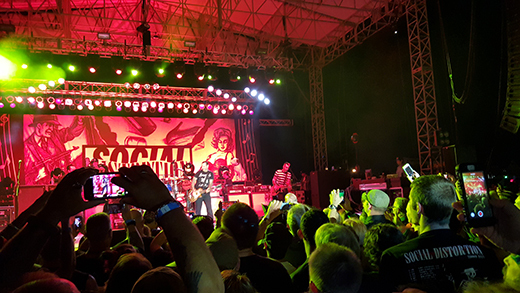 The open air summer stage of the Stone Pony is an ideal venue for feeling the super charged atmosphere that Social D generates, in no small part due to the zeal and ardent enthusiasm of front man Mike Ness and to his sincere effort to reach out with appreciation and affection to the audience. Nikki Lane’s fine country-alternative band from Tennessee served as a great opener and was warmly received by the crowd. 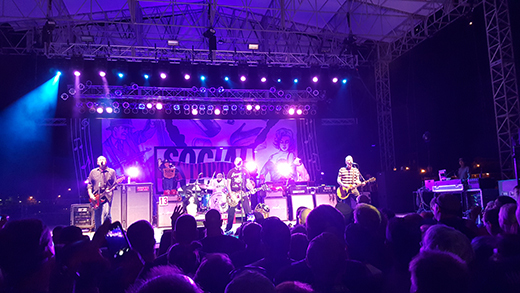 The sun was heading down toward the end of their set and a perfect half moon shone brightly to the southwest around 8:45 when Social D roared on stage with “So Far Away” then “Let It Be Me,” “Story of My Life,” “Sick Boys” and “Ball and Chain,” all five in order off the self-titled album. The crowd responded by forming a joyous, but ferocious mosh pit, diligently moderated by attentive and sympathetic security staff. 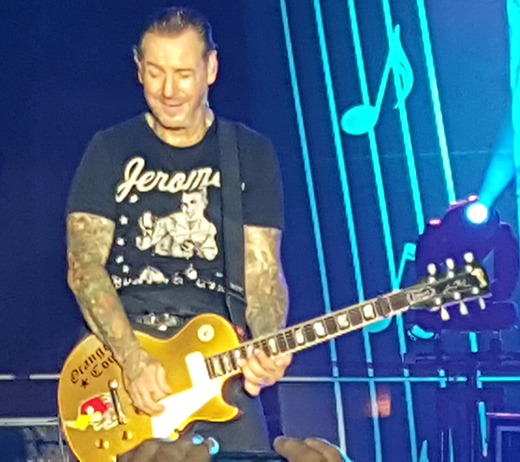 Ness stopped to address the crowd and announce that this tour was in celebration of the 25th anniversary of their eponymous album, their third, and the first one with a major label (Epic). 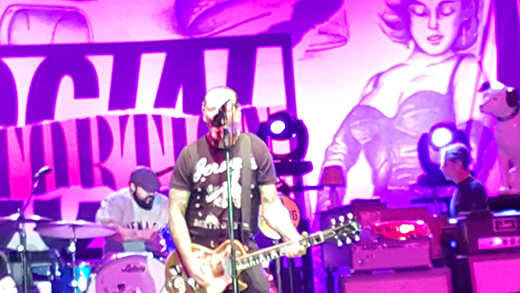 By the time that self-named album was released, Mike Ness and Social D had been knocking around for 12 years, starting in 1978, with the first single in 1981, and had endured a period of band member turnovers, an early tour with Youth Brigade, eventual entanglement of Ness in heroin addiction, breakups of the band, rehabilitation and eventual stability. He reminded us that he was now and forever clean of drugs and alcohol. Once more, during an instrumental interlude Mike spoke to the crowd before turning to a selection from their fourth album, “Somewhere Between Heaven and Hell” namely “Cold Feelings.” As had been demonstrated repeatedly during the concert, and again at this time, Ness performed with remarkable virtuosity on the guitar. The mosh pit never quit during the show. Inevitably there was one fool who thought to turn the situation into one involving fisticuffs, but the security staff hustled him off the premises in a highly professional manner and before anything serious could occur. An authentic country feel was brought out by “This Time Darlin” with its waltz-beat. He introduced “Far Behind” by way of telling how he felt it was better to leave people who antagonize you far behind rather than get into fights with them. There was no real intermission, although lights went down onstage once. “Don’t Drag Me Down” was played just before the finale, the June Carter Cash/Mel Kilgore classic, “Ring of Fire” which was performed in two segments. Taking a pause from singing, while the instrumentals kept going low in the background, Mike spoke to the crowd, drew a half dozen kids ages 9 – 12 on stage and encouraged them to apply themselves in school for their future benefit. There was an exuberant resurgence of “Ring of Fire” and a jubilant conclusion to the show.